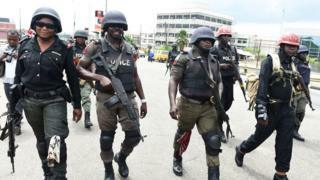 Vice President Yemi Osinbajo don agree with many Nigerians wey dey talk say dem suppose divide di federal Nigeria Police into state police force. Image example Osinbajo talk say im believe say state police go make security strong all over di country. Osinbajo talk im mind for di opening ceremony for one national security meeting wey di Senate organise, on top herdsmen killing and other crimes inside di country. "State police na di way to go" according to Osinbajo. But im still talk say di current number of police for di country suppose increase by 300% and also police budget must go up if Nigerians wan make dem deliver good result. Herdsmen killing don affect many states for Nigeria especially for di north-central region and Nigerians dey vex say di Nigeria Police no dey try on top security matter. For January, herdsmen kill more than 70 men, women and pickin dem, wey be one of di worst attacks wey don happen dis 2018. Dis two-day meeting still dey happen for di NAF Centre for di Nigeria capital city, Abuja.